This post is about an adjustment to Cover 1 that is designed to defend offenses who use a fullback. 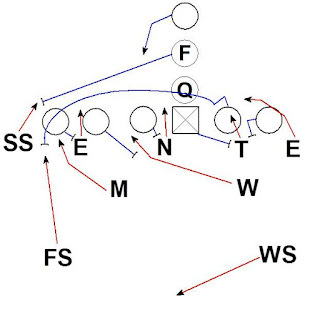 It follows up on previous posts about Basic Man Match-ups in Cover 1 and Cover 1 Technique. 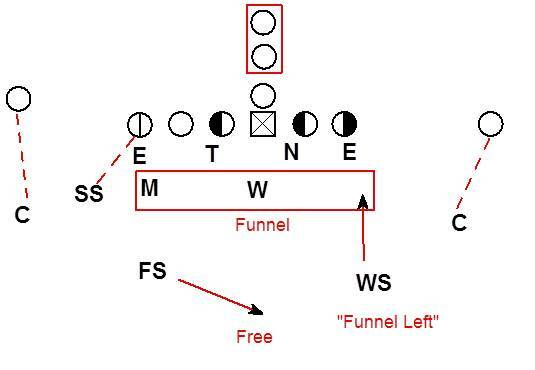 In those posts the coverage concepts of Funnel and Fiddle are explained. For more info on Funnel and Fiddle be sure to check out the previous posts. 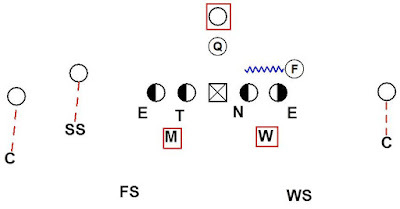 Fox technique is another solution for the defense to handle 2 back formations. 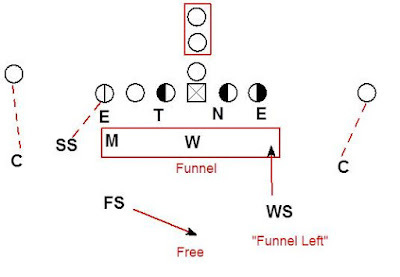 Instead of using the Funnel (3 on 2) technique vs. 2 back formations the defense can elect to use a Fox technique. In Fox technique the 2 LB's play Fiddle on the RB and the Safeties play Fox technique on the FB. 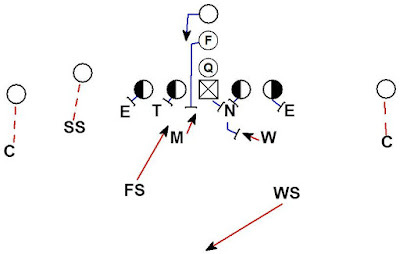 In Fox technique the 2 Safeties match up with the FB based on where the FB goes. Here the Corners are matched up with the #1 receivers and the SS has the #2 receiver strong. The Linebackers (Mike & Will) are playing Fiddle on the RB. The FS and WS are playing Fox on the FB. The FB goes to the FS's side. 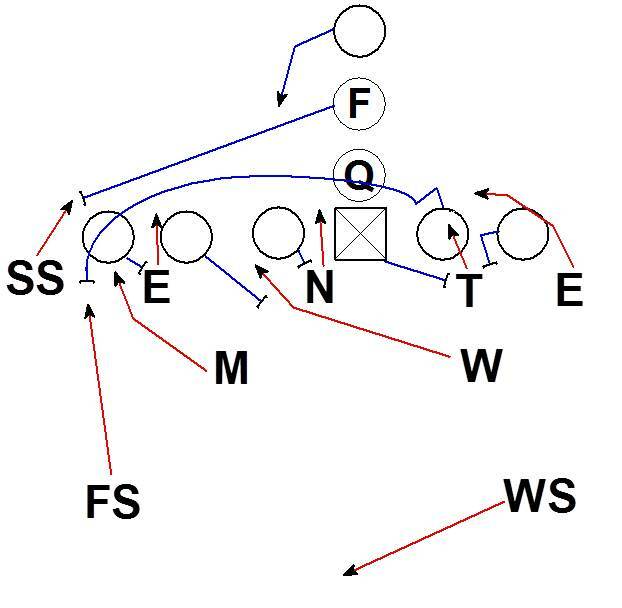 The FS drops into the box to man cover the FB. 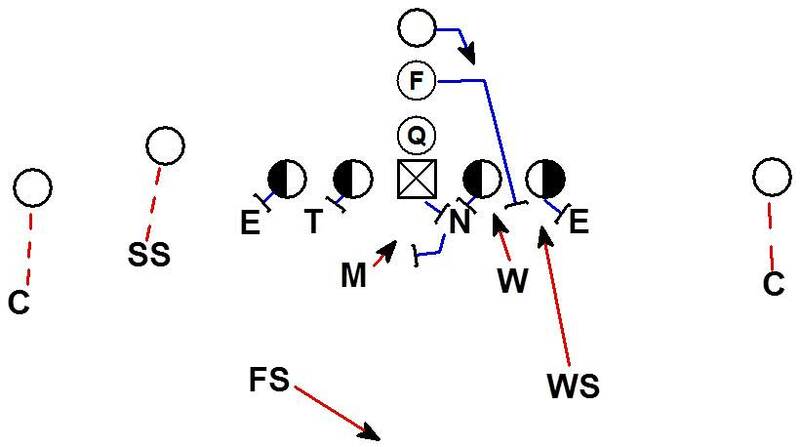 The WS reacts to the FB going away buy rolling to the deep middle and becoming the free player. 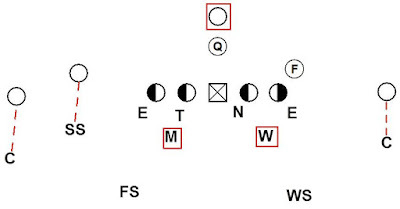 When the FB goes to the WS's side, the WS drops into the box to cover the FB while the FS rolls deep to be the free player. 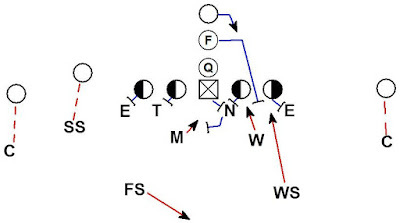 Against the run, Fox technique allows the defense to get an extra player where needed. Here the offense is running Iso or Lead to the strong side. 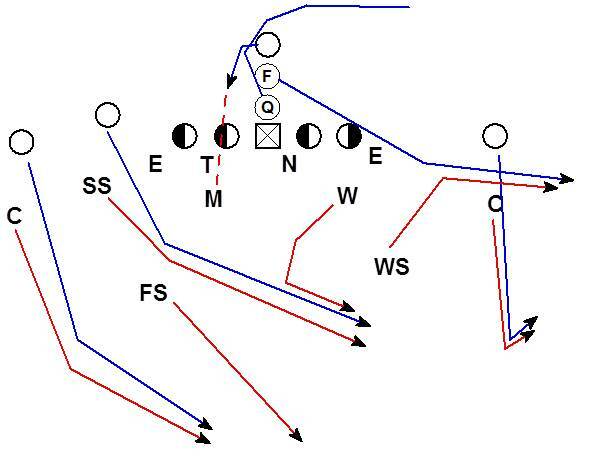 When the FB leads to the FS's side the FS foxes down and brackets the FB's block with the Mike. If the Will is cutoff by the Center/Guard combo block, the defense still has an unblocked player at the point of attack. 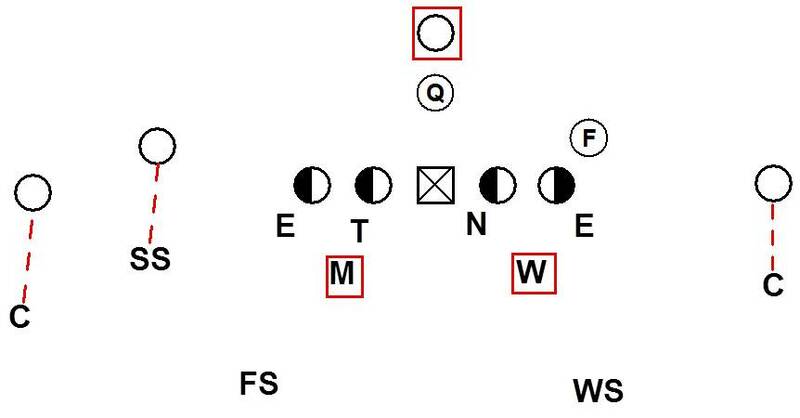 Against Iso to the weak side the Will and WS are able to bracket the FB's block. Again the defense has an unblocked player at the point of attack. Here the offense is running Power to the TE. 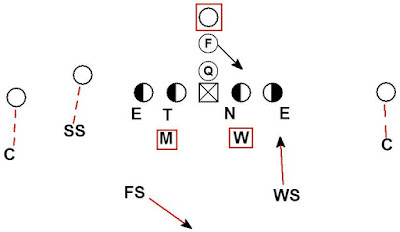 The TE blocks which allows the SS to trigger vs. the run. The FS foxes down on the FB and the Mike reacts to the flow of the RB. 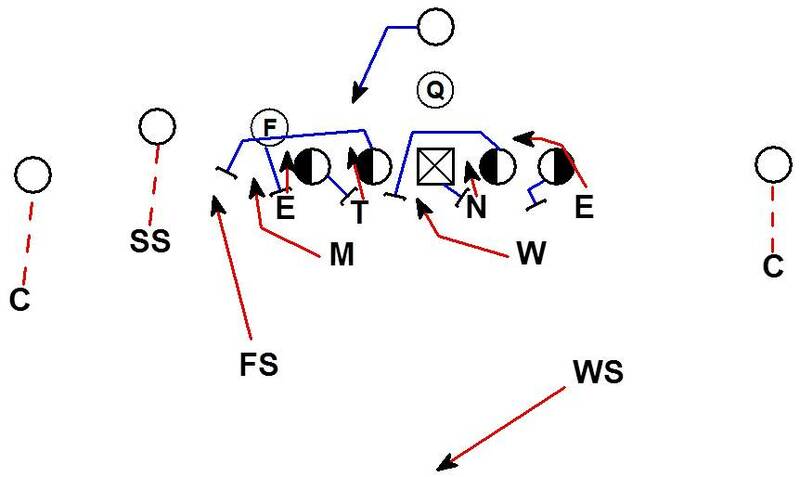 The end result is 3 defenders (SS, FS, Mike) for 2 blockers (FB, Puller). Again there is an unblocked defender at the point of attack. 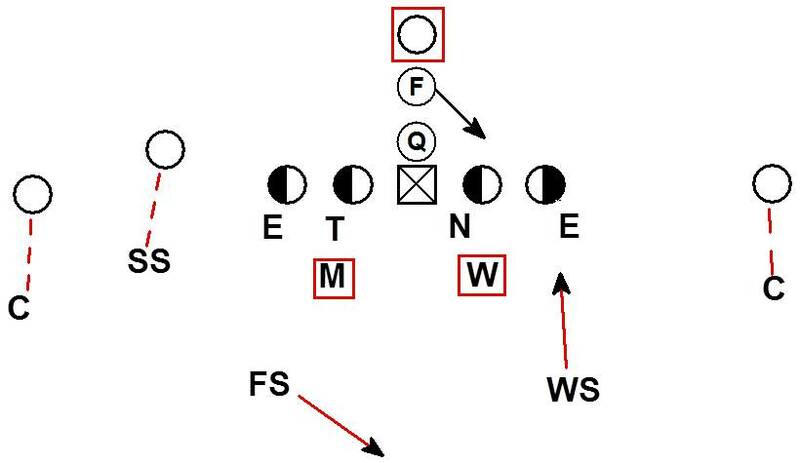 How the defense fits power specifically is affected by how the scheme uses the DE. 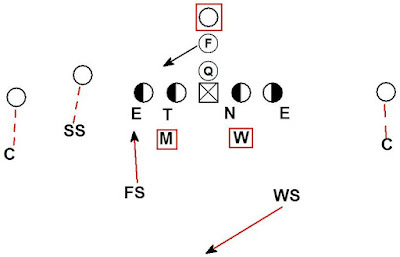 Here the defense uses the DE in the C gap. This could be a head up DE playing in to the C gap, a DE aligned inside shade on the TE, or a DE slanting into the C cap. The final result is the defense forces the puller to go wide. The Mike can scrape and fit inside out on the puller. The SS is outside the FB while the FS is between the blocks of the puller and the FB. 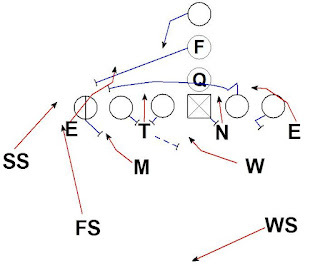 Here the defense uses the DE in the D gap. The DE reacts to the down block by the TE and can either wrong arm the kick out block of the FB or box that block. In this example the DE wrong arms and should get one or both blockers between the FB and puller. Even if the TE is able to block the Mike, the defense has 3 vs. 2. 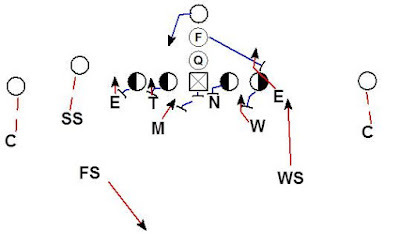 The SS, FS, DE vs. the FB and puller creates an unblocked defender at the point of attack. 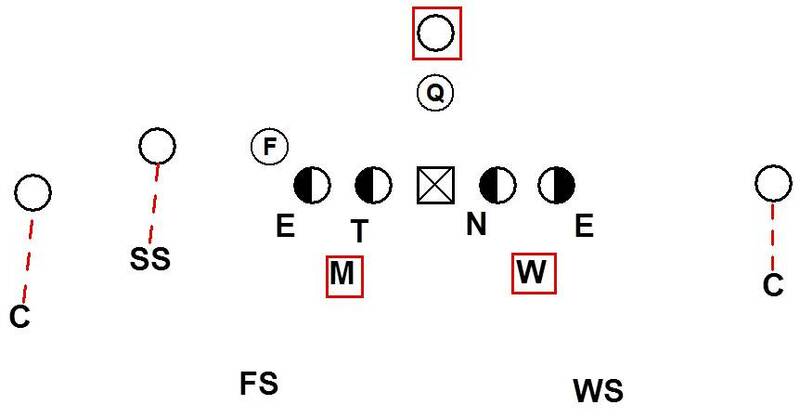 If the DE is able to wrong arm and get both the FB and puller the defense has both the SS and FS unblocked. Here the defense aligns in an under alignment. The defense can choose to have the SS react to the down block of the TE by Forcing or Wrong Arming. 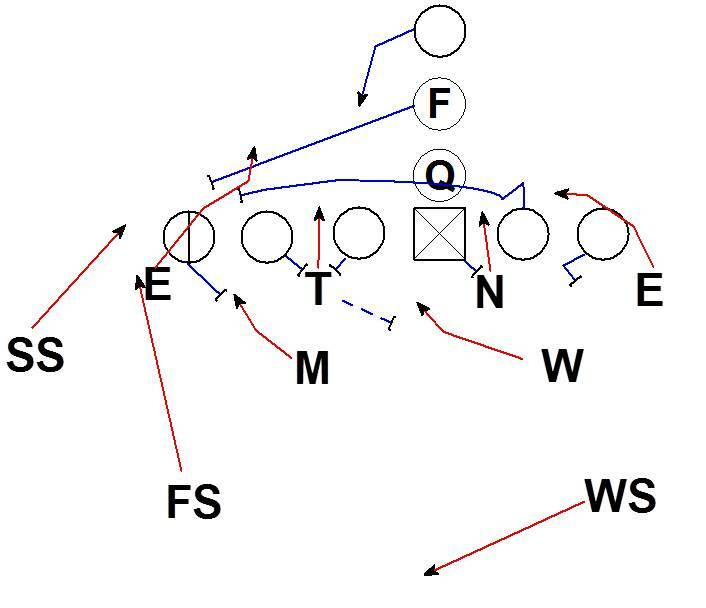 No matter how the defense chooses to play the SS against a down and kick out scheme the defense is again 3 on 2. SS, FS, Mike vs. the FB and puller. All of these same concepts apply with the power going to the weak side. The only difference is the WS is foxing down to be the extra defender at the point of attack. Against split zone the Mike and Will will react to the flow of the RB. Here the DL and LB end up fitting to control all the gaps. 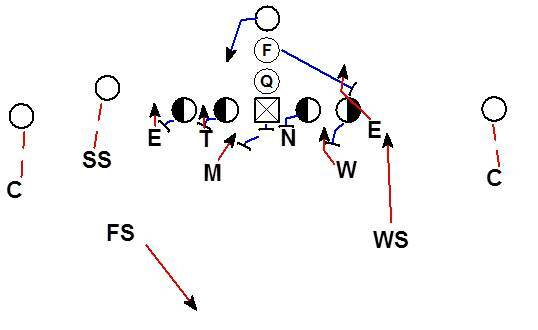 Often the RB is forced to cut back and follow the backside cutoff block of the FB. When the ball cuts back the foxing WS is there as an unblocked defender. 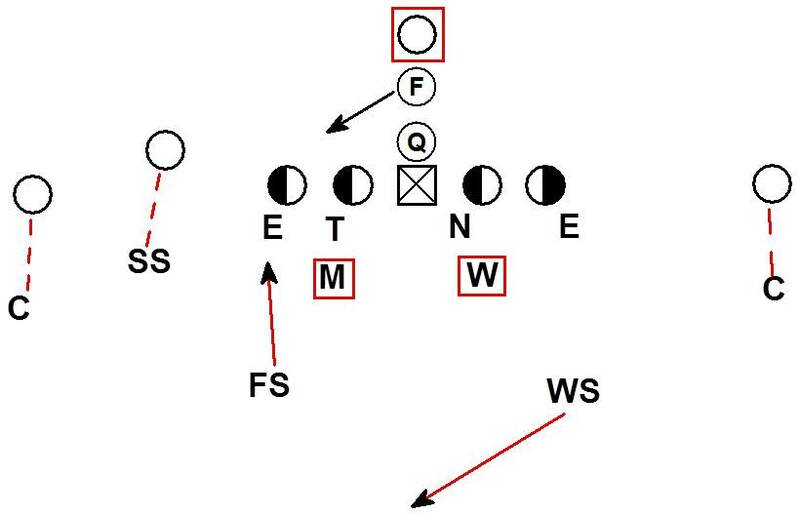 The defense can choose to wrong arm the FB's block with the DE or box that block. The fit of the DE will dictate if the WS will fit inside the DE or outside. 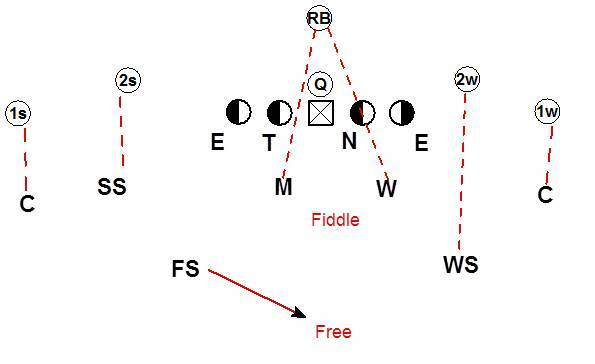 In this example the DE is wrong arming the FB resulting in the WS fitting outside. Against a boot or naked concept the coverage should be able to match up. 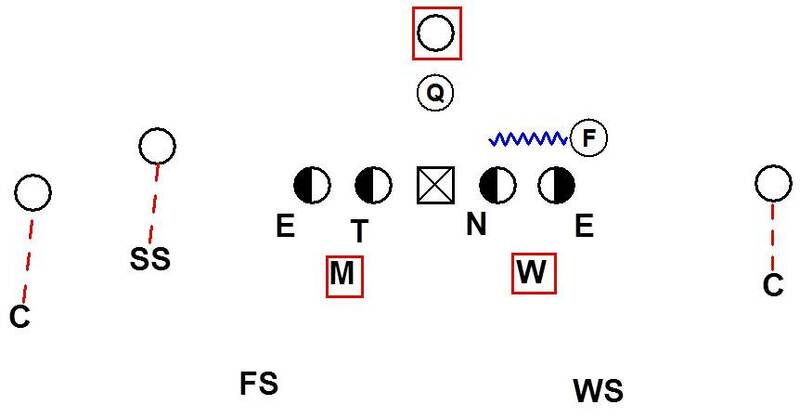 The WS foxes down and covers the FB to the flat. The FS is free and can double cover the post with the Corner. The Mike man covers the RB. The Will becomes the Hole player in Fiddle technique and doubles the crosser with the SS. Fox technique can also be used against 1 back sets. Here the offense aligns with a player on the hip. In the diagrams above that player is generically labeled as the F. The hip player could be a FB type, or a TE, or an H back. The FS and WS can fox off that player. If the offense chooses to motion the F, the defense has little to no adjusting. 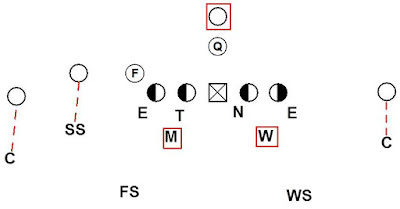 Once the ball is snapped the FS and WS will fox based on the release of the F and get the extra player where the defense needs it. 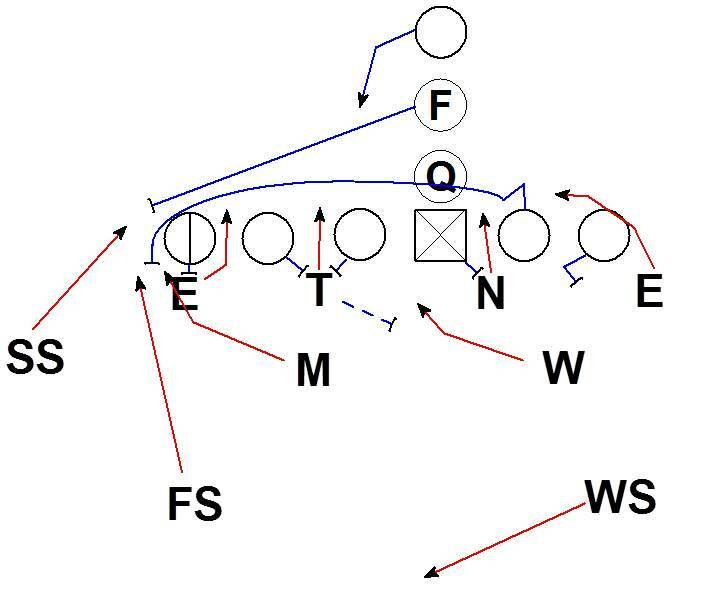 If the offense is using the hip player to run Iso, Power, Split Zone, or boot the end result is same as it was from the I formations diagrammed previously. The fox technique is also good for defending other schemes being run with a hip player. 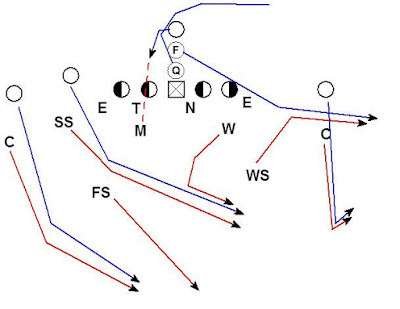 Here the offense is running a pin and pull concept. Once the F blocks the FS foxes down into the box. The FS and Mike bracket the lead puller. All of the interior gaps are controlled by the 4 defensive lineman and the Will. Fox technique can also be good vs. spread concepts. 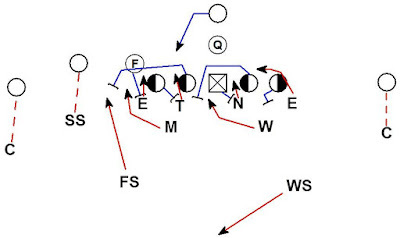 Here the offense is running zone read with the F wrapping as a lead blocker if the QB pulls the ball on the read. In this example the defense plays a scrape exchange with the DE chasing for the RB and the Will LB scraping over the top for the QB. The WS foxes down on the F wrapping around while the FS rolls to the deep middle and is free. The WS and Will can bracket the F creating a 2 on 1. The QB is forced to pull the ball into an unblocked defender. 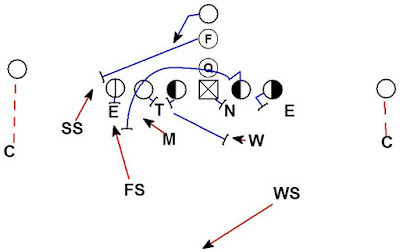 Fox technique is a useful adjustment for a Cover 1 scheme when facing an offense that uses a FB. Really great stuff, I'm loving the cover 1 stuff. One other adjstment in the this coverage I've come across is this the lock/bass one, where a LB and the SS have a fiddle on a tight end and an offset back, to prevent rubs that way. Saw it a lot in some old Wade Philips playbooks. I love this article. I see it's value immediately. How do you play Fox against split backs? I suppose you need to find who they use as the fullback? If they are a 20 personnel with a Fullback/Tailback you could still Fox the Fullback guy. However most 20 personnel split gun teams have interchangeable RB's. We don't run Fox vs. split gun typically.